I'm Curious Too: What Does It Feel Like Getting Drunk? I was part of the crowd that flooded the Haadrin beach for the Full Moon Countdown party in Koh Phangan, Thailand last week. If you haven't read about it already, please do it here. 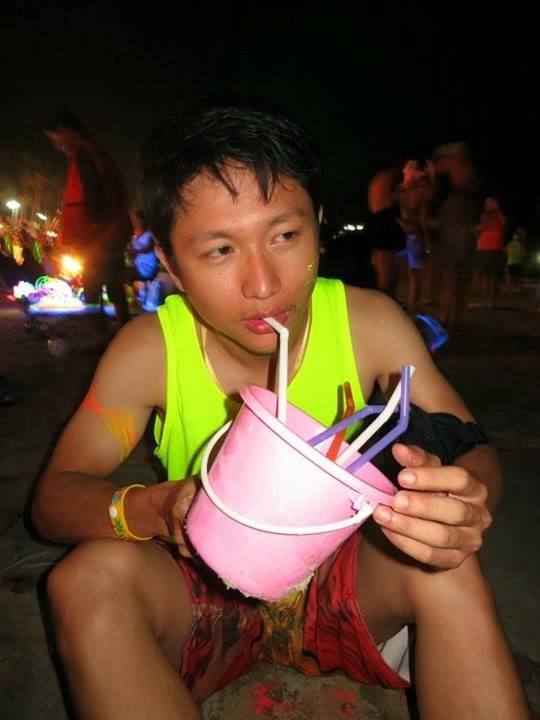 I drank three buckets of the infamous cocktail and then, according to my friends, I got drunk. So how does one know whether a person is drunk? First, he murmurs sh*ts you don't understand. That includes those who present their final year project without knowing what the hell they have done. Secondly, he can't stand/walk properly. Thirdly, he falls asleep, but he hears whatever sh*t you say about him. One of the more vivid details I remember was how bits and pieces of information came storming into my brain via my five two senses-an appropriate analogy would be like synapses firing uncontrollably. I lost the ability to open my eyes (it felt like a two-ton curtain) and so I could only sense the lights and the sound of music blasting around me. The lights were especially glaring, I didn't smell anything and I could barely walk properly; in one instance I stumbled face first onto the beach and felt nothing. I tried to keep myself awake and tried to retrieve information from my brain (forcing my friends to quiz me) in an attempt to prove that one could still reason despite being under the influence (and surprisingly I did reasonably well in the math quiz). I could still sense people around me; I heard people talking to me, though I could not hear them properly. My brain was still working, though my limbs were not listening. Alcohol, it seemed, had had all my motor neurons switched off. And amid the confusion, one question lingered in my mind: how does alcohol make you drunk? Yep that's me right there, weak and vulnerable. Then it came; the urge to vomit. It was burning in my throat already by the time I held on to a pail nearby. Throwing up is a painful process for those who have yet to experience one by the way. The vitriolic fluid (possibly caused by the stomach acid) that came up together with the alcohol burned my throat and some even got into my nasal cavity. And according to my friend who observed my entire ordeal my vomit was enough to fill an olympic-size swimming pool. Okay not exactly swimming pool, but I vomited so much I probably had all the alcohol in my system flushed out. By the way I think those sh*ts you've seen in HongKong movies where the girls got raped by drunk men are not entirely plausible. I mean look at me, do I look menacing at all when I'm drunk? More weak to intimidating I guess. 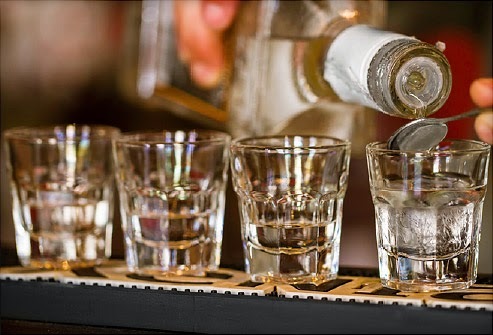 1) Alcohol intoxication happens when alcohol flows into your bloodstream faster than it can be metabolized by the liver (at the rate of one ounce per 90 minutes). 2) Alcohol moves into your brain and causes lots of dopamine to be released and that is supposed to make you feel good (I felt horribly weak; I repeatedly yelled at my friend: why are we doing this? We're from the top university in the country, and supposed to be the erudite, perfect example for the rest of the society). 3) Alcohol molecules block the glutamate--the thing that excites neurons-- receptors in your brain, so you'll have slower, depressed response. 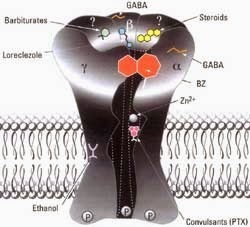 4) Alcohol also binds to GABA (gamma aminobutyric acid--it slows your brain) receptors and makes a person sleepy. Alcohol intoxication is not something new. In fact there was an article on the NYTimes last year that wrote how alcohol shaped the human civilization. However, why do humans keep inundating their livers with the onerous task of cleaning up the harmful ethanol in their system? Having too much alcohol would simply shut down vital parts of your brain (eg. those that control simple movement like blinking and breathing) and cause you to, well, literally forget to breathe, and thus die from asphyxiation. Alcohol has also been linked to breast cancer, high blood pressure, and a plethora of other illnesses. However, it's not like alcohol doesn't have any benefit at all. Alcohol keeps you warm; and that'd be especially handy on chilly nights (and I thought that was the reason why human started drinking alcohol in the first place). And a glass of wine once in a while can lower your cholesterol and boost your brain. So you just have to monitor the amount of alcohol you let into your system; just be sure not to drink more than your liver can break down.